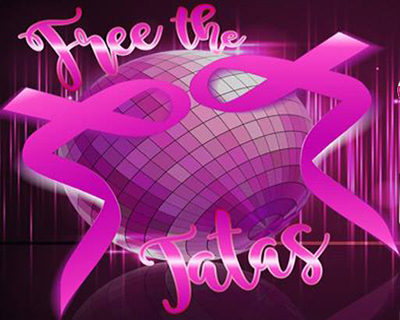 A body painting disco dancing event to “Free the Tatas” will honor Cathy Bart and Judy Lieberman while raising awareness and support for Hadassah’s breast cancer and genetic research programs. The Sept. 9 event at The Cannery also is part of the centennial year celebration for Hadassah New Orleans. Participating artists included Aidi Kansas, Madalyn Goff, Marilyn Cothren, Gretchen Armbruster, Tracy Hammill, Craig Tracy, Brittney Peloquin, Colleen Hickey, Teri Brasher, Aimee Farnet, Pam Soileau, Ben Benson, Jenny Bell Gremillion, Monica Kelly, Meghan Davis, Sarah Early, Emory Nolan, Lai Xiao and Susan Gisleson. The Disco Ball will also include an auction featuring Chuck Mutz from The Black Tie Auctioneer. Entertainment will be provided by Crescent City DJ, with a special performance by Trixie Minx. The event will feature the cuisine of around 30 local restaurants, including Brick Oven Café, Byblos, Café Equator, Caffé Caffé, Casablanca, Cool Brew coffee by New Orleans Coffee Co., Copeland’s of New Orleans, Crêpes á la Carte, Fausto’s Bistro, Five Happiness Restaurant, Joey K’s Restaurant, Kosher Cajun, Lebanon’s Café, Lil Dizzy’s Café, Louisiana Specialty Drinks, Martin Wine Cellar, Maurice French Pastries, Melanie Blitz Catering, Mikimoto Japanese Restaurant, Parkway Bakery, Pho Orchid, Puerto Rico Coffee Inc., Red Dog Diner, Riccobono’s Peppermill, Ristorante Filippo, Rommel Catering, Stein’s Market and Deli, Toast, Vincent’s Italian Cuisine, and Dickie Brennan’s Steakhouse. On Aug. 17, there was the last Free the Tatas social in a series of events leading up to the Disco Ball. The social was at Cava. For the Disco Ball, “Good Vibes” tickets for age 40 and younger are $85. “Rock On” general tickets are $150. Patron tickets start at $250 and include a commemorative poster. There is also a $36 “Donation for a Friend” opportunity to honor or memorialize a friend. Additional names are $18.